I am still exploring running stitch. At the moment I am stitching into a small cloth that I found at the local op shop when I was on holidays recently. The fabric started life as an old linen tray cloth or napkin with a small amount of clumsy embroidery on it. I have pulled the embroidery out and been stitching tea dyed gauze bandages over the surface. With the wisdom of hindsight I realise that I should have left the embroidery in and just stitched over it – well, maybe next time. It is a sample or prototype for a larger work I am planning to make for an exhibition in November. I will have to get cracking on that larger work soon as time is slipping by, and as time passes, that larger work is getting smaller. Because the cloth has is old and has been wahed many times it is soft and supple to stitch. It is very cathartic just to put a needle into same fabric and turn the conscious brain off. In fact any art exercise turns into a form of meditation for me. I am sure it is the use of my hands and the sole focus on what I am doing that quietens my mind. There are times when what I want to do doesn’t work out and I get frustrated and toss it aside but I try to go back to it and work on it again later. I have learnt to accept that some things don't work; either because of bad design and planning or it is just plain wrong! But also that also I have learnt that I need to push through frustration and keep working on a project. For this I have to thank textile artist Jean Draper. I was very fortunate take part in some workshops with Jean in late 2000. Jean herself is very inspiring and I have linked to an interview on the web here for you to read at your leisure. Jean was very generous with her time and mentoring during the few days I spent with her. 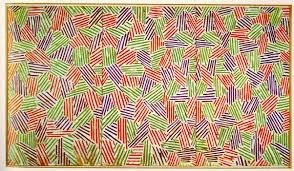 During the course of the workshops Jean told us about artist JasperJohns and quoted him: Do something to it. Do something else to it.